Huddersfield had much the greater share of territory and possession in the first half and then Wharfedale took over for second period. Most of the game was played at the river end of the Avenue. This was odd as the breeze was blowing the other way! A bit of afters saw the end of the game for Wharfedale’s scrum half, Sam Gaudie. Spiers was informed by referee, Ben Russell, to be careful with the elbow! 12 minutes later the visitors extended the lead to 12 points with a Jack Maplesden try which was converted by Johnson. This was after sustained pressure on the Dale try line with Maplesden breaking a tackle on the 11th phase from short range. Dale were not getting the best of the decisions from the officials and worse was to come. On 27 minutes George Hedgley was Yellow Carded for a “reckless” clear out at a ruck. Two phases later, after the ensuing line out, Dan Stockdale, was working well at a ruck only to be held in a strangle hold. The Huddersfield player was politely. Asked to take his hands away from Stockdale’s neck but not penalized! Huddersfield sensed blood against the Dale 14 and strived to increase their lead. A slow pass from Chris Johnson was pounced on by Dale’s Harry Bullough. Bullough ran the ball in from 65 metres. Jack Blakeney-Edwards slotted the extras. Dale gave away field position from the restart when Rob Baldwin was penalised for going through the gate, driving through the ruck and getting over the ball. Dale survived with a combination of good defence and strong play at the breakdown. They seemed to have weathered the storm when they won a scrum penalty in their own 22 and Blakeney-Edwards sent the ball into Field’s half. Another curious decision cost Dale posession with Mr. Russell calling the line-out not straight! The crowd were even more incensed at the following scrum. Dale’s 7 men drove Huddersfield’s 8 back and the crowd cheered when the ref awarded a penalty. The cheers soon subsided as the award was to Huddersfield! This I do not understand. Toms Asejevs was burying his opposite prop and the Dale front row were outstanding. Adam Blades was awarded the penalty for going backwards and not holding his ground!!!! Huddersfield finished the first half strongly. From a line out outside Dale’s 22 they went through 17 phases before sending the ball right. Good handling and support was rewarded by an unconverted try for Will Milner. Wharfedale soon started to dominate play in the second half. The Yellow Card count was evened up when Huddersfield’s Number 7, Lewis Bradley, was sin binned. The only try in the second half was scored by Harry Bullough. Blakeney-Edwards missed the conversion. Bullough’s try was straight out of the Dan Solomi textbook. From a ruck on the visitor’s 10 metre line he scooped up the ball and darted off. With four Tigers chasing he had the speed to reach the line. Wharfedale could have scored more in the second half but the Huddersfield defence stepped up to the plate and refused to surrender. It is not enough to say that decisions went against Dale; this always happens. The Huddersfield players were clever enough to get away with a lot but stayed strong. Dale must find a way to score more points. The faithful can rejoice that the Green Machine has the third best defence in the league, behind Fylde and Chester. Jon Feeley, Wharfedale Head Coach, said after the game “It was a good hard game. Both sides were resolute in defence”. Many of the Wharfedale support complimented Rory MacNab for a solid performance. MacNab came on after 13 minutes to play at scrum-half in place of Sam Gaudie. 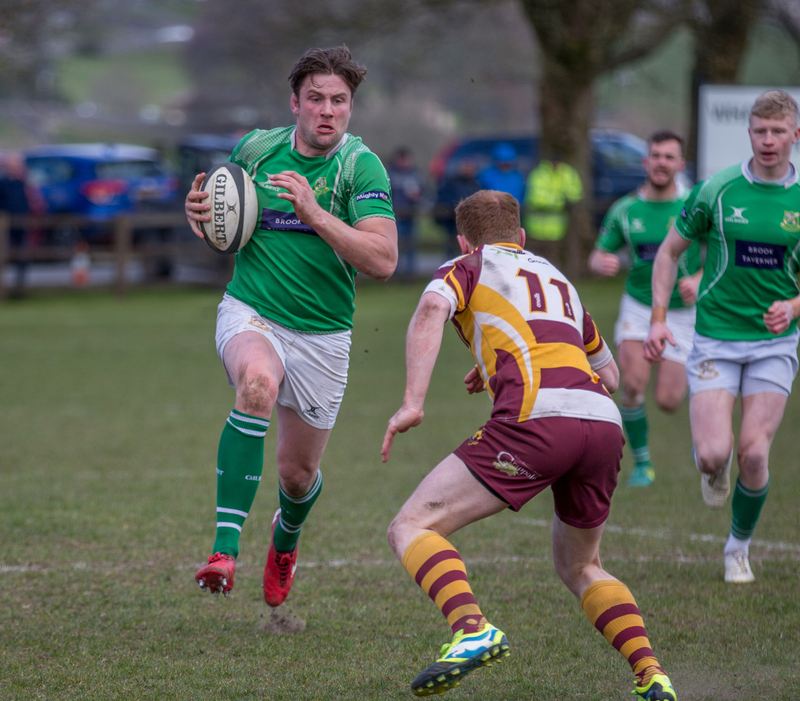 Wharfedale: – Louis Brown, Rian Hamilton, Harry Bullough, Will Edwards, Tom Mann, Jack Blakeney-Edwards, Sam Gaudie (Rory Macnab 13), Toms Asejevs (Joe Altham 54), Dan Stockdale, Reece Ward (Jack Hirst 65), George Hedgley (c), Ben Leacock, Kenneth Houghton, James Tyson, Rob Baldwin. Replacements not used: – Elliot Stockton, James Mason. Huddersfield: – Tries – -Spiers 12, Maplesden 24, Milner 72. Conversion – Johnson 24. Star Man: – Harry Bullough (Wharfedale).